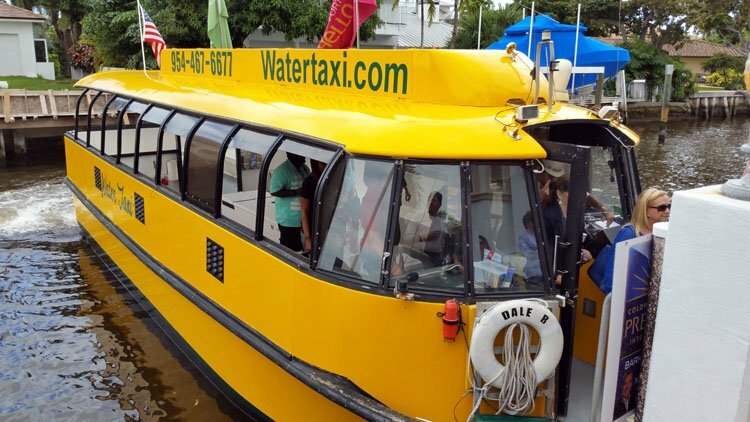 The Fort Lauderdale water taxi is a popular way to enjoy the Venice of America experience, whether as a means of sightseeing on the inland waterways of Broward County, creating a personal pub crawl or to view the Christmas lights of waterfront mansions. There are also periodic special water taxi tours, such as Art Fort Lauderdale, which debuted in January, 2017. 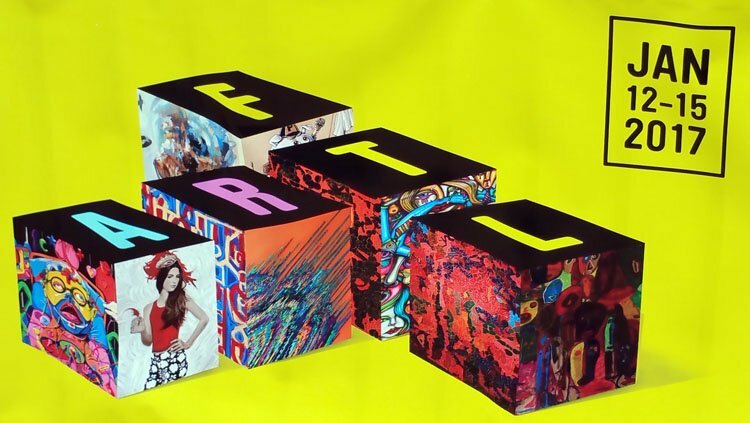 (Note: the second Art Fort Lauderdale is set for Jan. 25-28, 2018. Visit the website for details. It was one of those only-in-Fort Lauderdale events that sets life in South Florida apart from most places. 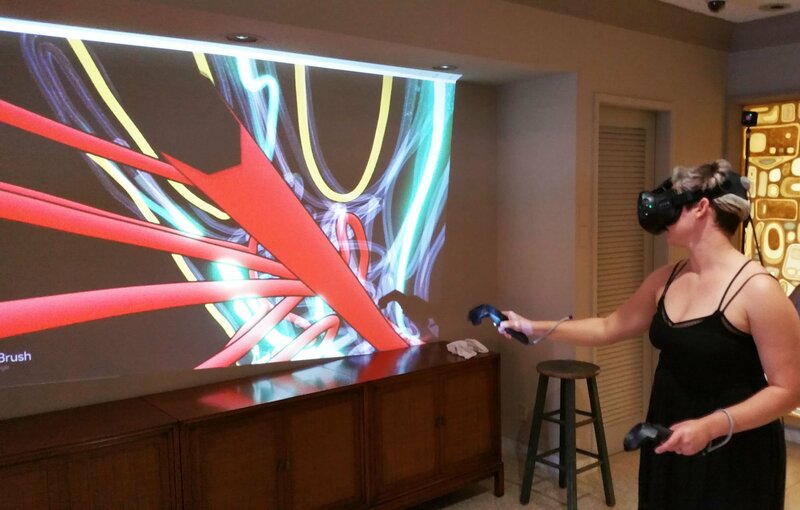 The premise was, take a boat ride to some waterfront mansions on the Intracoastal Waterway and view the works of local artists. Art Fort Lauderdale was billed as the first art show on the water in the U.S. To add the distinctive stamp of Fort Liquordale, before we boarded the water taxi at Bahia Mar Yachting Center, they poured us a cup of craft rum from a Fort Lauderdale distillery (Oak & Cane). The sweet libation set a party mood for an intriguing variation to a favorite staycation outing of ours. A couple times of year we like to spend a day riding the distinctive yellow water taxis that ply the inland waters of Fort Lauderdale and Hollywood, Fla. The art tour was a special event that utilized water taxis as shuttles for the unusual opportunity of getting to look inside some of those waterfront palaces that 99 percent of us could never afford. Such as the sprawling mid-century ranch referred to as the “Oscar Mayer House,” which is on the market for $22.5 million. 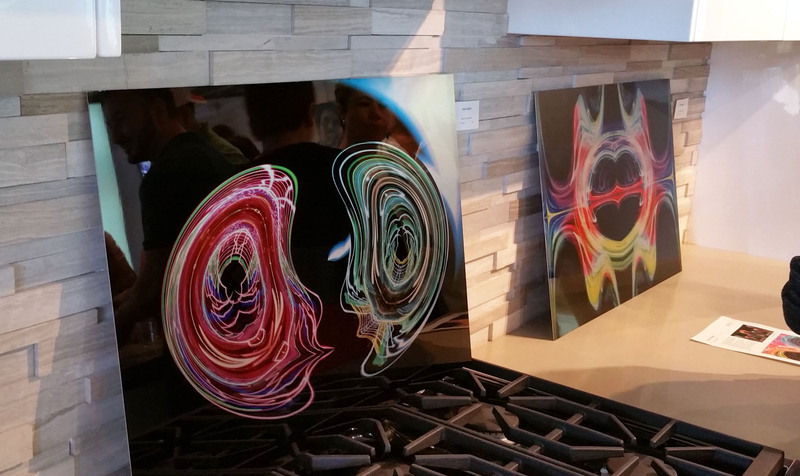 The art, on display at each stop, was the object. At the same time the tour took on the feel of a glorified real estate showcase. Not in an objectionable way; there was no real sales pitch. It was amusing to peruse details on the sell sheets for the houses, such as property taxes that far surpassed one’s own annual income. Our complaint was that there were stops at only three houses — and there wasn’t much art at one of them — which was disappointing after forking over $45 per ticket. The website had been vague on specifics. But with the event running from 1 to 8 p.m., we were expecting a full afternoon. 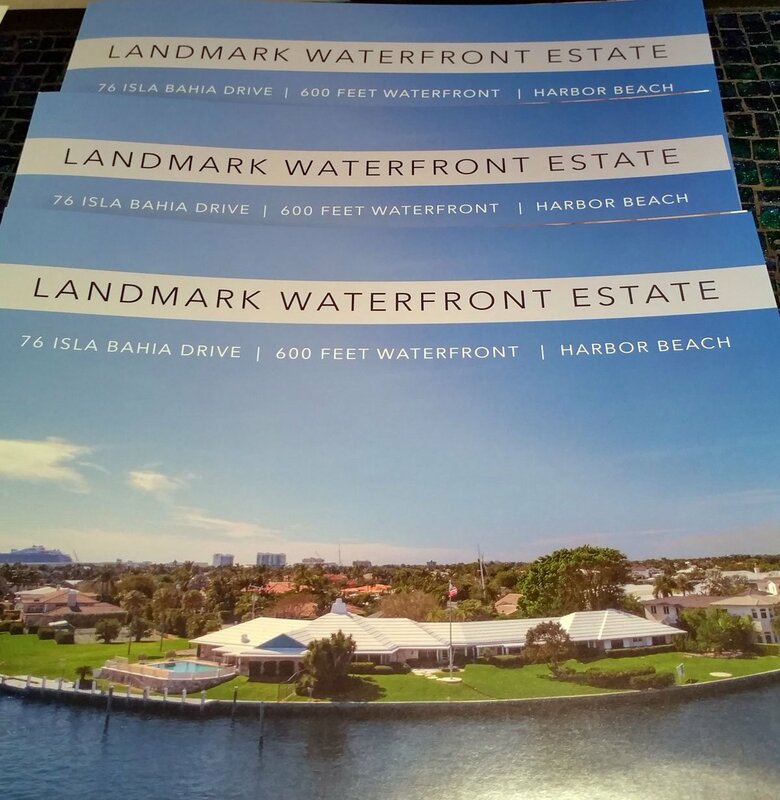 As it played out, the three houses were close to Bahia Mar. So the ride on the water taxi was short, and in a little over two hours we were back at the dock. Having spent $90 for the pair of tickets, we were left with a feeling of, is that all there is? We mentioned it to one of the organizers and he said they’d aim to offer more venues next year. We didn’t regret the experience, though. It was something different. And that Oak & Cane rum was delicious (smooth on the rocks, didn’t need a mixer). It provided a comfortable buzz that enhanced enjoyment of the art, which included some unusual performance bits along with paintings and sculptures. Climbing ashore at a palatial two-story estate in the Las Olas Isles, listed at $2.675 million, we were greeted by a work in progress on the back lawn in which an artist was turning a young woman with Chica Cherry red hair into an abstract painting. Not something you see every day, particularly in this toney neighborhood, no doubt. 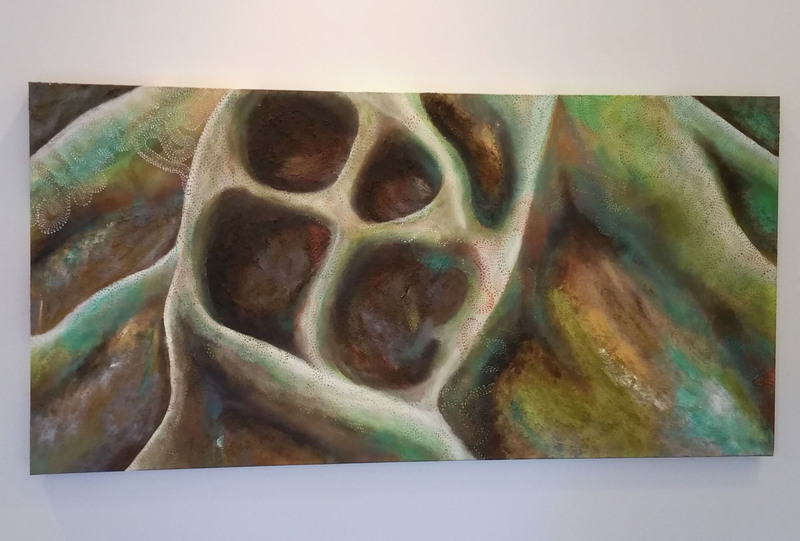 The rooms in this house on both floors were loaded with interesting works of some talented South Florida-based artists, including Lifrancis Rojas, Jennifer Haley, Kevin Vigil and Andres Felipe Bardales. There was also a lip bar and an eyelash bar for visitors who wanted to become subjects in the artsy spirit. The most memorable part of the outing was reserved for the final stop, the Oscar Mayer House, which was a trip both for the styling — a relic from the Rat Pack era — and for the art that was displayed and played out there. The second Fort Lauderdale Art Tour is set for Jan. 25-28, 2018. The massive one-story structure, with nearly 9,000 square feet of living space, is situated on one of the most prominent pieces of real estate in Fort Lauderdale with 600 feet of waterfront that wraps around a point just south of the New River and within sight of the megayachts moored at Bahia Mar. It was built in the mid-’60s for Bob Friedman, an Ohio industrialist and notable big-band songwriter, and wife Eugenie, who was a granddaughter of Oscar Mayer, the weiner magnate. A flag on the pole outside simply read “Hi,” setting the tone for a funky visit. 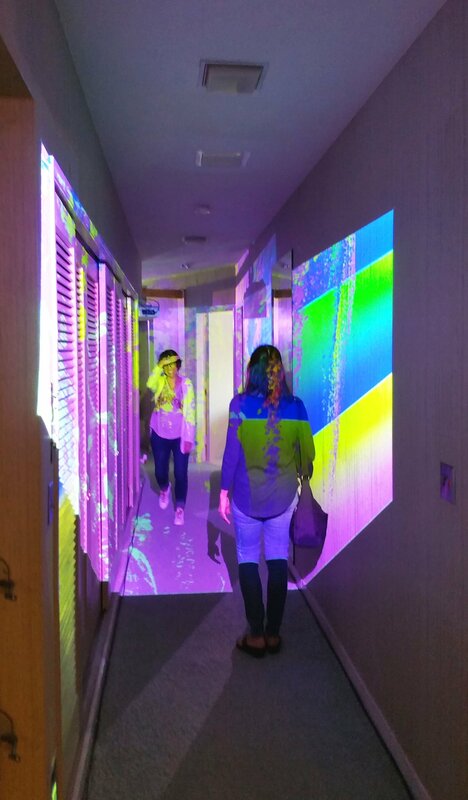 Just inside, a virtual reality painting program was set up for visitors to demonstrate their creative bent and there was some freaky psychedelic projection imagery creating a surreal passage down a long hallway that provided access to the seven bedrooms. 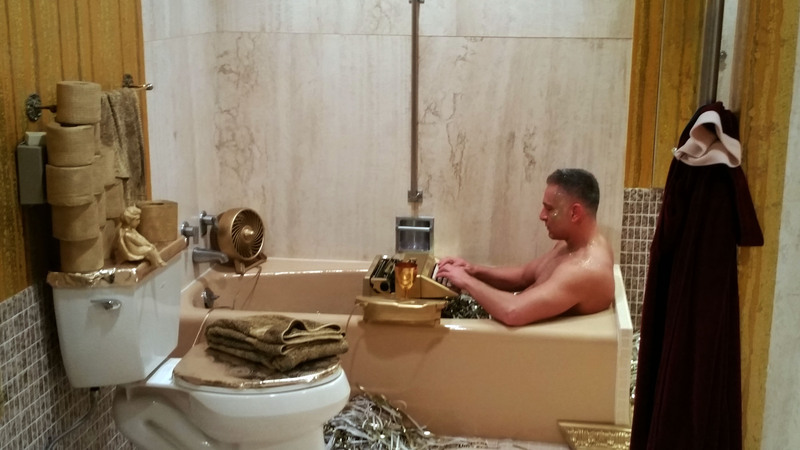 One bathroom looked like it belonged to Scarface, another was set up as a performance studio and featured a man typing in the bathtub. 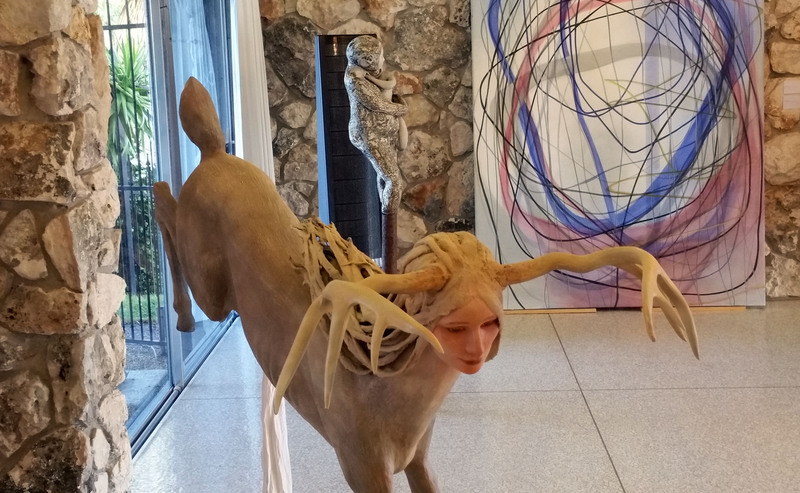 But most striking were the sculptures of Leah Brown, who is well known in the area for the surreal mythical hybrid figures she sculpts, part human, part animal. Brown happened to be in a bedroom where I stopped to admire one of her creations, a trio of creatures in a circle, one with the head of a deer, another with the head of a bear and the last with a head of a panther. I understood her work a lot better when she explained that much of it was inspired by her dreams. Most captivating of her sculptures was a leaping deer with prominent antlers that has a young girl’s face. Some of the others were a bit jarring. 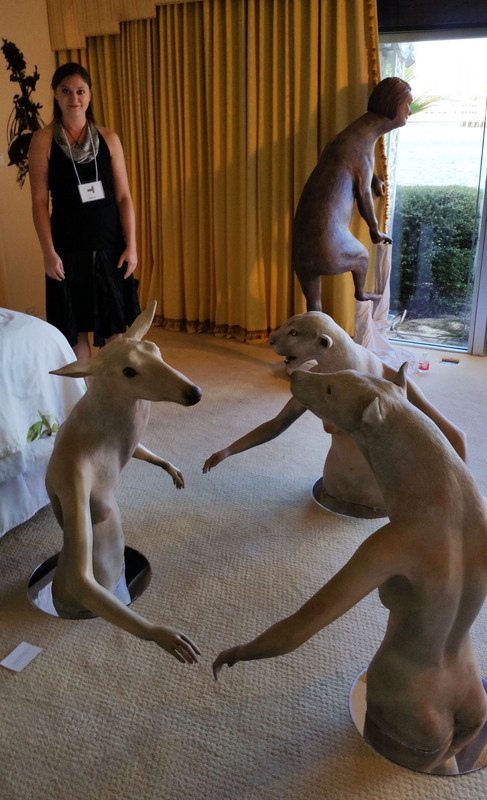 She pointed out the irony of her pig people sculptures stationed in the living room of a house that belonged to an heir to a company that made hot dogs. “I hope they wouldn’t be offended,” she said. While many of my fellow tour patrons seemed unsure what to make of the unusual house and retreated to the dock to await the water taxi, I doubled back through the maze of rooms, curiosity piqued about the former residents and their life there. It was uplifting to learn about the Friedmans, who were married nearly 65 years and raised five children. Bob, who died in 2013 a month after celebrating his 90th birthday, ascended to CEO in a long career with The National Machinery Company in Tiffin, Ohio. He received a patent for a machine that made the first seamless aluminum cans and another related to blades for jet engines. He served as an officer on the battleship Texas during World War II. Bob wrote “Serenade to Genie” for his wife. The Friedmans — Genie died in 2014 — were known for numerous philanthropic efforts during their years in Fort Lauderdale. The circle of life rolls on an unstoppable cycle. Theirs left an imprint on the community. It was easy to imagine the sounds of family filling the big house that flies the flag “Hi.” There were five children, fifteen grandchildren and twelve great grandchildren. Feeling the vibe that lingers, with a huge blue marlin still adorning the rock-faced wall in the living room, it is easy to imagine the Friedmans would have appreciated the humor in the presence of the pig people. The art tour whetted our appetite to plan another water taxi day. The bright yellow Fort Lauderdale water taxis run three routes from downtown Fort Lauderdale on the New River and on the Intracoastal Waterway from northern Fort Lauderdale to Hollywood at the south end of Broward County. There are numerous places to jump on and off the taxis. Many of them are restaurants and bars, as well as the Las Olas shopping district in the heart of Fort Lauderdale. There are also 2-for-1 beer, win and cocktails on the daily Happy Hour Tours after 5 p.m. Happy Hour tickets are $18. The newest route is the Margaritaville Express, running from the Seventeenth Street Causeway to Jimmy Buffett’s latest resort that opened in late 2015 on Hollywood Beach, passing through Port Everglades by the cruises ships and freight terminal. We made our first visit to the resort in early 2016 on a crisp, sunny Saturday aboard the water taxi Island Adventure, enjoying the sights from the top deck on the southward swing through the port and on the inland waterway south of Fort Lauderdale. They had a bar on the main deck — it is Fort Liquordale, after all — so we had a margarita to get into the spirit of the occasion. If you time it right, you’ll be ready for a refill when the taxi docks at the 5 O’clock Somewhere Bar and Grill across A1A from Margaritaville Resort.